The Pacific Community (SPC) and the World Food Programme (WFP) have signed an agreement that aims to increase the effectiveness of their service in assisting Pacific Island countries and territories in achieving their resilience building and development aspirations. 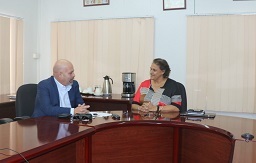 The four-year partnership was signed this week between SPC’s Deputy Director-General, Dr Audrey Aumua and Mr Anthony Freeman, WFP Pacific’s Officer in Charge. “SPC is delighted to be working more closely with the regional Pacific Food Security Cluster (rPFSC) to support the Pacific’s efforts in building capacities to better prepare for, and respond to external shocks and to strengthen resilience of the most vulnerable in the face of Climate Change and other crises. This agreement reflects the resolve of our respective organisations to draw on each other’s expertise, competencies and resources for the benefit of Pacific Islands people,” Dr Aumua said. “The Pacific region is unlike any other in the world, and the World Food Programme is passionately committed to its mandate of disaster preparedness here. We are honoured to be partnering with SPC who share our dedication to Reaching the last mile – That is, working towards a Pacific where nobody is left behind when it comes to disaster preparedness and ensuring regional Governments’ have the highest standards of support available via alliances such as that formed here today,” said Mr Anthony Freeman. This new partnership fosters better collaboration on emergency preparedness in the areas of food security, logistics and emergency telecommunications. It includes supporting the development of an online platform for mapping of emergency relief items in the Pacific, exchanging information and experience as well as collaboration on communication upgrades and assessment activities that both organisations undertake in the Pacific region. The World Food Programme, is the United Nations’ frontline agency in the global fight against hunger, mandated to provide emergency and development assistance to eradicate hunger and poverty amongst the poorest and most food-insecure countries and populations. SPC is the principal scientific and technical organisation in the Pacific, proudly supporting development since 1947. It is an international organisation owned and governed by 26 country and territory members. The organisation works across more than 20 sectors including food security, climate change, disaster risk management, gender equality, public health and human rights.